Nudged by his rereading the DUNE series, James has coined various mechanisms and limitations for real prescience and will present some of his ideas. Can one get real info, but, be then locked into a self-fulfilling (and self-limiting) process? Does one get info (from a “higher” source) to control/limit you? Does the information come from one’s imagination, and this is at best arbitrary and at worse dangerous? Is perhaps the info from parallel universes, and thus, does not necessarily apply to this one? Is the whole process simply a delusion? 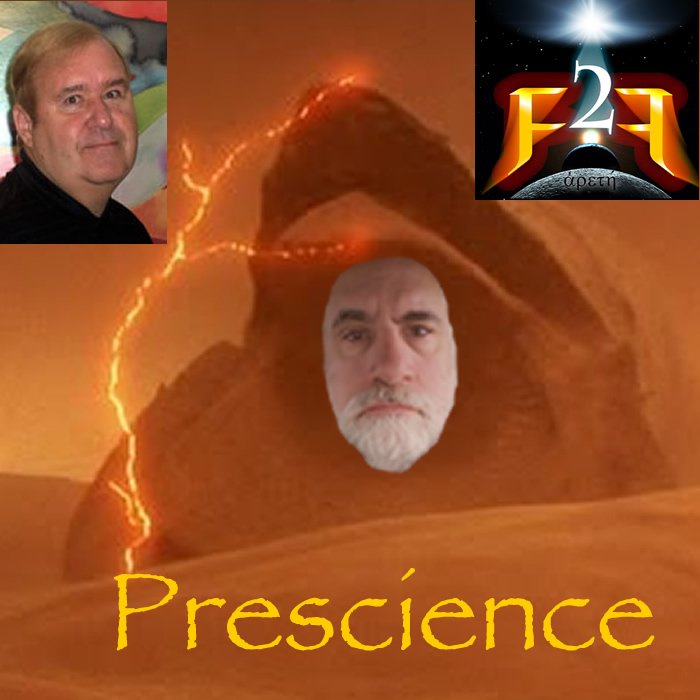 Then, psychic and friend Jim Shultz returns to talk prescience from his personal and professional point f view and what he might be “picking up” for the near and long-term local and worldwide. No Les Visible segment this week, He is still recovering. No new word. Not many links tonight as most will be me explaining the mechanics and methods of Prescience. This entry was posted in F2F Audio, F2F Video and tagged Dune, Jesus, Jim Shultz, Matrix, metaphysical, Prescience, Reality by BLKnight. Bookmark the permalink.